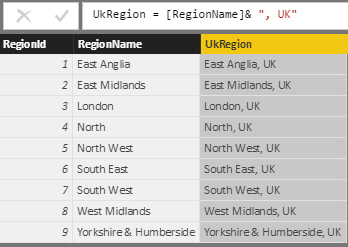 Create a calculated column adding the letters UK onto each region (I'm assuming a similar tactic would work for any other country). 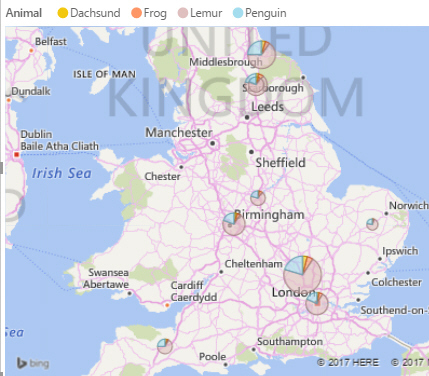 We're using the UkRegion to identify where sales took place. At least all sales are taking place in the UK, but the North-West region should be centred over Manchester (as one example). What's happening is that we're relying on Power BI Desktop to decide where the North-West is. It would be a better idea to position data exactly, and to do that we'll use the fact that we know the postcode of each shopping centre in which a transaction took place, and from this can derive the latitude and longitude setting.